Dauntless, the free-to-play action-RPG with some nods towards Monster Hunter, is set to hit its Open Beta later this month on May 24. Prior to that date when anybody and everybody can get in, developer Phoenix Labs is dropping a major update to the game today, and it's a pretty substantial one. Dubbed "Seeking the Horizon," this update includes an overhaul of some existing systems (like progression and gear), and an expansion upon others (like available quests). 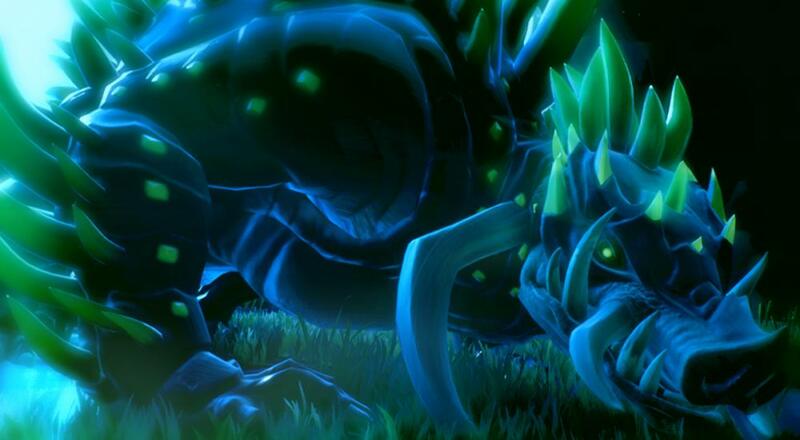 The Progression System: Dauntless’ new progression system is not merely an update to quest lines or crafting requirements, but a new platform on which Phoenix Labs will build the stories of the world, the relationships with the characters that inhabit it, and the content they’ll be adding for years to come. An Evolving World: Islands will rotate in and out of the range of Ramsgate throughout the life of Dauntless -- the islands Slayers explore and the activities that are available on them will change over time. Diversity of Quests: The diversity of quests that are available to Slayers is being widened with new side quests offering unique rewards (like lanterns). Gear Updates: Additional features and content for the gear, set perks, cells, and customization systems will increase the overall diversity of these systems. When Tally and I checked out the game previously, there were "bones and some muscle", but not much else. With this update, things appear to be getting flushed out even more and I think you'll be able to see more than just, "ok, let's go hunt this Behemoth, I guess?" There were some initial quests/hunts to do to setup certain systems, certainly, but the update to progression in particular is nice to better guide players into everything. After dropping 300+ hours into Monster Hunter: World, I'm intrigued to jump back into Dauntless and see how these updates/improvements have changed the game. The other feature discussed in that blog that will be fully implemented once the Open Beta drops is the "Evergame" (this is Phoenix Labs' alternative to the traditional "endgame"). This system will provide players that have completed the main campaign with additional challenges in the form of "Dire Behemoths" (tougher variants of the ones you've hunted countless times already, by that point) and hunt modifiers that will impact the way you approach the hunt (not a lot of details here yet, but sounds intriguing). To draw further parallels between this game and Monster Hunter, this sounds like the equivalent of High Rank and Tempered monster hunts. The last time I played Dauntless, I had never played a Monster Hunter title, though I've messed around in other games (e.g., Toukiden 2, God Eater) with similar ideas. Now, having had the experience of a formal Monster Hunter game (and a pretty good one, at that), I'm eager to hop back into Dauntless and see how things play out. You can be sure we'll be streaming some of this during our regular Monday night "Let's Play Co-Op" streams in the near future. Dauntless is currently in Closed Beta on the PC. It will enter Open Beta on May 24. Page created in 0.3469 seconds.